I enjoy eating barbecue. And, through a cosmic blessing of fate that I daren’t question, my wife enjoys eating barbecue as much as I do. Our favorite barbecue is of the North Carolina variety. So when a family friend was getting married in Chapel Hill a few weeks ago, we decided to make a vacation of it. That vacation would be focused on barbecue. REALLY focused. Over the course of seven days (really eight, but that includes a Sunday, when all pits were closed), we ate at twenty-one barbecue joints. I’m going to give a recap of some of this barbecue in just a moment. First, I should address the inevitable question: Why? (Side note: I never would have thought that anyone would need a justification for eating a bunch of barbecue; but people ask all the same.) I’ve circled in on a few explanations for our seemingly-insane vacation plans. Barbecue tastes good · Very, very good. It is difficult to overemphasize the importance of this factor. Midwestern earnestness and work ethic · Maybe it’s just the way I was raised, but I figure that if I’m going to do something, I ought to do it right. Which means doing it [ahem] whole hog [hold for laughter]. To spend a week in a part of the world with great food, yet wasting some of my meals by not eating that food, is to display a sort of transcendental ingratitude toward my good fortune. Cultural carpetbagging · I grew up in Wisconsin, which has its fair share of indiginous culture. But there’s pleasure to be found in trying on a culture that is not your own, if only for a while. (What do you think powers academic history and the tourism industry?) Barbecue in North Carolina has a history, a dictionary of codewords, a set of conventional practices all its own. By immersing myself in this for a while, I’m certainly not going to pass myself off as a native – but it does enable a kind of empathy and connection with natives that might not otherwise be possible. Is that reason enough for us to devote our vacation to barbecue? Fine, sheesh. ‘Barbecue’ generally refers to the slow cooking of meat via low, indirect heat, typically using smoke. 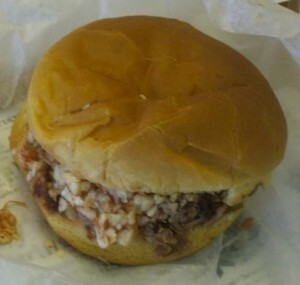 In North Carolina, ‘barbecue’ almost always means pork, which is almost always chopped/pulled and served with a thin, vinegar-based sauce. In NC, you typically order either a sandwich (a scoop of meat on a cheap supermarket hamburger bun) or a platter, which is a larger helping of meat. Both usually come with cole slaw. Hushpuppies, or some other fried-corn delicacy, are often available. In the eastern part of North Carolina, whole hogs are smoked overnight. The meat is chopped and dressed with a very simple sauce (cider vinegar, Texas Pete hot sauce or red pepper, a bit of sugar and salt). In the better places, the skin is thrown back onto the smoker and dried out, after which it’s chopped into small pieces called cracklings and mixed into the meat itself. The cole slaw in ENC is generally cabbage and carrots, and dressed with mostly vinegar and just a bit of mayo to bring it together. In western NC, the style of barbecue is called “Lexington”, after the small town containing what must be the highest per-capita number of barbecue joints on God’s green earth. Lexington barbecue is pork shoulder rather than whole hog. This means no cracklins. But the tradeoff is the caramalized “brown” or “bark” that forms as the shoulders smoke. Lexington-style sauce is similar to ENC sauce, though generally with ketchup added and less hot sauce, making for a much sweeter sauce. 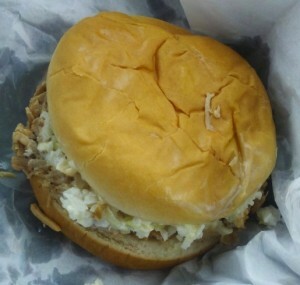 Most Lexington places serve two different kinds of slaw: one made with mayonnaise, and the other made with the same barbecue sauce that goes on the meat (called “red slaw” or “barbecue slaw”). Hushpuppies are a fixture on this side of the state. The styles aren’t radically different, though each has its die-hard proponents. Rebecca and I are fairly solidly in the Eastern camp, though there are great places in Lexington too. For better or for worse, the best places in Eastern NC are way off of the beaten track. But they are really, really worth the trip. As a Social Web Professional, I have some thoughts about starting a more authoritative site for the collection of barbecue knowledge. But I am also a humble Northerner, so I probably won’t do it. Date: June 22, 2011 · Author: Boone Gorges.